A year and half long struggle to run Palestine Advocacy Project’s (PalAD) original ‘One Word’ campaign on the T came to a head this Monday, at a meeting with the Massachusetts Bay Transportation Authority’s (MBTA) Fiscal and Management Control Board. Palestine Advocacy Project recently re-ran an ad in Davis Square that had been taken down in violation of its contract in 2014. The poster, which features the image of a young Palestinian girl and presents statistics about Israeli military violence against children, has been the locus of a growing debate about how the MBTA should handle political advertising, culminating in yesterday’s meeting. Members of the PalAD team attended to speak in favor of using public transportation as a platform for debate and communication, stressing the need for open dialogue and responsible advertising guidelines. The packed boardroom at the MBTA headquarters. Photo by Boston Magazine. Activists from the Watertown-based American for Peace and Tolerance (APT) came to oppose the ad, and called for the MBTA to fire the employee who had approved it. Charles Jacobs, founder of APT, has a history of opposing pro-Palestinian and pro-Muslim initiatives. In 2014, he supported the suspension of Northeastern University Students for Justice in Palestine Leaders, and has accused the Islamic Society of Boston of supporting terrorism on multiple occasions. Jacobs accused the MBTA of anti-semitism because it had run PalAD’s pro-Palestinian ads, but not anti-Palestinian ads created by the American Freedom Defense Initiative. Those ads read “In a war between the civilized man and the savage, support the civilized man. Support Israel. Defeat Jihad.” Jacobs also took the opportunity to insult the ACLU, calling them a group of “legal thugs.” Several members of APT stuck around to harass Palestine Advocacy Project members after the meeting. They screamed slurs such as ‘self-hating Jew’ and ‘all Arabs are terrorists’ during Colbath-Hess’s interview with local reporters. The MBTA Fiscal and Management Control Board voted unanimously to discontinue any political advertising, effective December 1st. Boston is following in the footsteps of other large East Coast cities, such as New York and Philadelphia, which have banned political advertising, often in response to other ads by the American Freedom Defense Initiative. It is unclear if this ruling will result in the early removal of the ad in Davis Square that sparked this wave of controversy. The December 1st cutoff for political advertising will cut short a contract between the Palestine Advocacy Project and Intersection, the agency which manages advertising space on the MBTA. 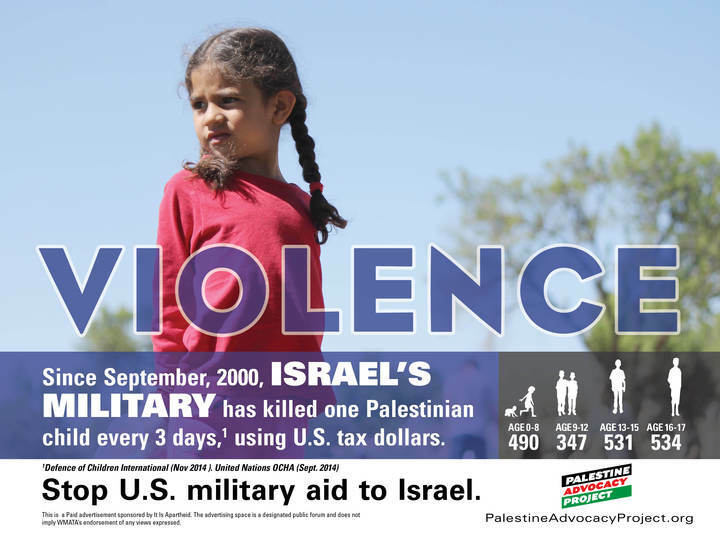 Until then, the Violence ad will be on display at the Davis stop in Somerville, educating the public about the consequences of the Israeli occupation. She’ll be on the inbound platform at Davis Square until the end of November. 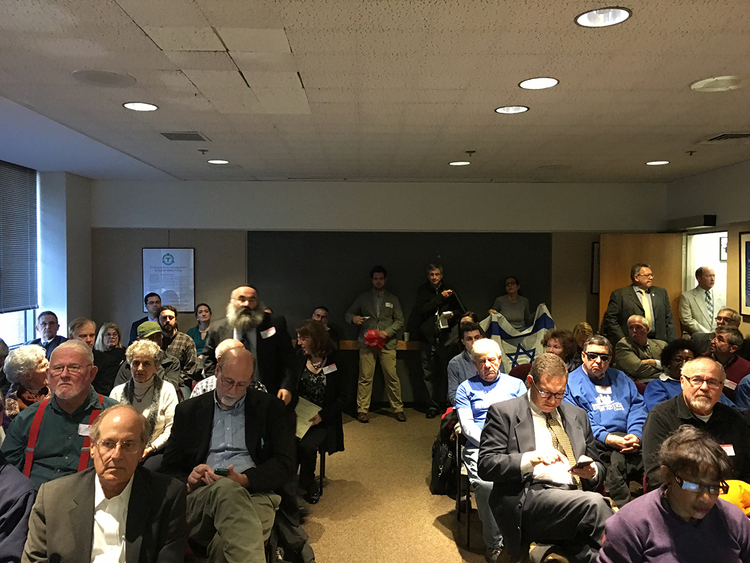 The showdown in the MBTA Boardrooms has caught the attention of the Boston Globe, Mondoweiss, and Jewish Voice for Peace. Many are appalled at insults and accusations of anti-Semitism levied at Palestine Advocacy Project. Palestine Advocacy Project is moving forward with exciting plans for 2016, most of which should not be impacted by this setback.